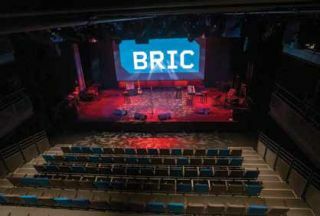 A vital element to the growth of Brooklyn’s artistic community since 1979, the BRIC Arts Media House presents some of the borough’s most widely renowned and beloved arts and media programs. In order to keep the center’s facilities aligned with the needs of the community, the City of New York and BRIC, with AV design by JaffeHolden, renovated its 40,000-square-foot multidisciplinary arts space to create a new contemporary arts gallery, a media facility, and a flexible performance space (240 seated and 400 standing) for patrons. To allow signal routing to the new spaces and throughout the entire venue, North American Theatrix turned to BTX’s custom plate products. Set up across the facility, the plates are the main interface for input/output connections of the center’s audio, video, control, and networking needs. Using drag-and-drop technology, integrator North American Theatrix was able to easily specify and order custom bulkhead plates and rack panels for the installation, enabling the BRIC to have a fully functional system in time for the center’s opening date. For the BRIC installation, North American Theatrix further tailored the plates via the software’s customized engraving option.